The more difficult a bar is to find, the more I’m likely to appreciate it. Bo Peep Cocktail & Highball Store is clearly marked in plain sight next to The Rag Trader but I just happened to miss it upon arrival. I for one do not know what a highball store is but I do know what a highball entails. Off we went to explore the underground piano bar and cocktail lounge. Bo Peep brought us back to time when getting dressed to the nines for a drink was the norm. The cocktail lounge is conveniently located below The Rag Trader so you can begin your evening upstairs and make your way down as the night progresses to indulge in live music. The space is set up as if you’ve transported back to an intimate tailor’s fitting room. It’s a playful nod to the Bo-Peep Manufacturing Company that occupied the building in the mid-1900’s. The luxe lounge offers an air of mystery and whimsical elements through fringed lamps while the plush seating channels comfort. There’s not a single detail to be missed– the bar is even made from a tailor’s old drafting table. There’s also almost always a piano-based singer adding a touch of elegance and entertainment. The Rag Trader and Bo Peep Cocktail & Highball Store are inspired by the great vigor of the Garment District in the 1940s, back when it boasted the highest concentration of garment manufacturers in the world. 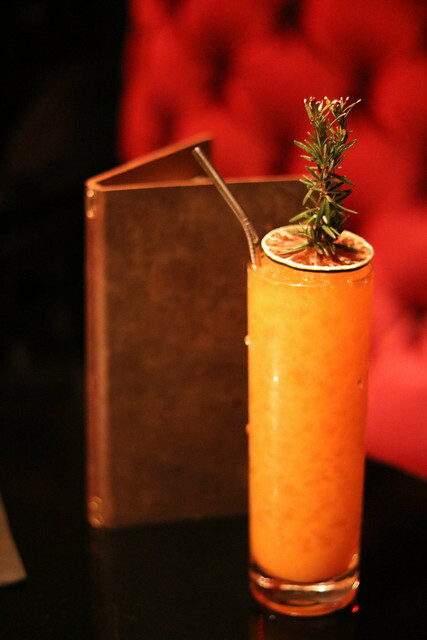 The sultry bar pays homage to those who dedicated their lives to stitching the fabric of the past. Mark Fox is the visionary behind this concept and founder of FOX Lifestyle Hospitality Group which includes Banc Cafe. Fox “imagined the seamstresses and tailors working on this very floor 70 years ago and wanted the decor to pay tribute to just that.” He pictured the walls coming alive to reveal the hidden story of the days when the neighborhood first flourished as a creative fashion capital. Upon arrival I immediately thought of the numerous dates I would subtly suggest to be held at Bo Peep. Priya, a cool gal pal and new neighbor joined me for the evening to indulge in cocktails and a side of small plates and piano. Bo Peep is certainly not a place I would have frequented in my early or mid twenties. At a ripe 30 years, it’s exactly the kind of spot I would delightfully spend my evenings now. The menu also draws inspiration from the mid 20th century and is divided into a categories such as Tiki, Swizzled & Crushed; Sours, Flips & Fun; Stirred, Boozy & Serious; and Fizzes, Bubbles & Smashes. Swizzled and crushed is certainly my style so the Jalisco Switchblade was my first choice. Most cocktails are priced at $16, which is pretty standard for a cocktail bar. The tiki drink had a base of tequila mixed with spiced carrot, lime, and pineapple smoked rosemary for added flavor and flair. Priya ordered the Cat’s Meow from the fizzes, bubbles and smashes section. 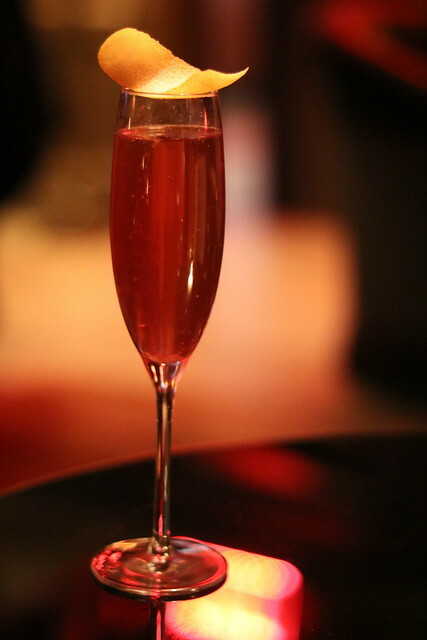 The sparking cocktail includes rosé, blanc vermouth, elderflower, grapefruit and bitters. It was sweet and just strong enough to make an impact. Fresh from work, we desperately needed nourishment and shared a burrata crostini and a margherita pizza, both of which we recommend. For a blustery night in February and as someone with an affinity for tea, the Tunisian Toddy was an obvious choice. The warm cocktail is a play on a traditional toddy. 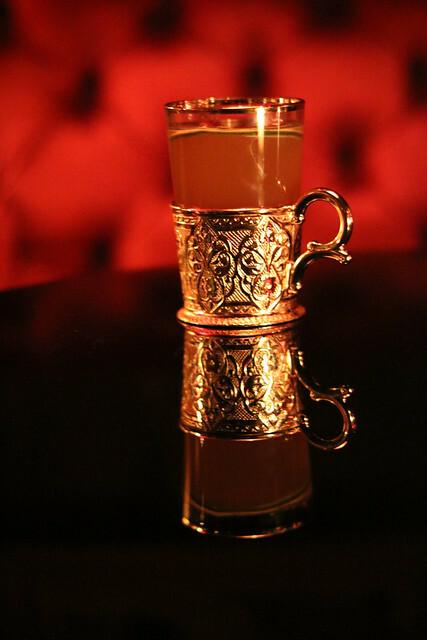 Mint tea, bourbon, rye, lime and Morroccan spice are served in a gorgeous golden and glass encrusted mug. The tea cocktail not only looks stunning upon arrival but tastes even better. Lastly, Priya ended with a highball. The Bird’s of a Feather cocktail is a mezcal based beverage that also includes rum, sweet vermouth and notes of cinnamon and vanilla for an added kick. 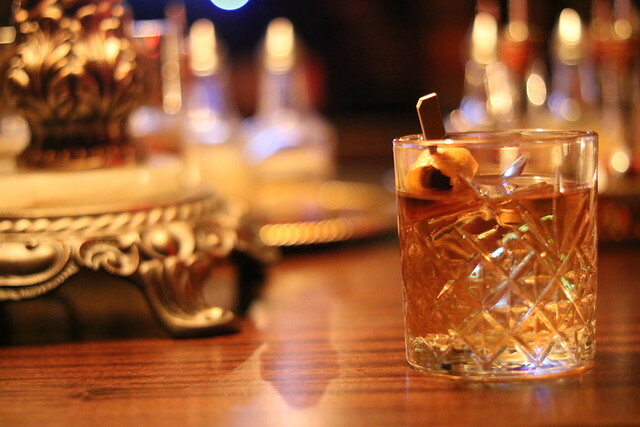 The highball is a solid choice for a nightcap. As the night was winding down for us, Bo Peep was only winding up with musical entertainment. For a weeknight, it was time for us to retire early but we had set our sights on coming back with friends. Bo Peep is a seductive bar that will transform you back into the flourishing days of the fashion district in the 1940’s, sip on elegant cocktails and enjoy dancing piano keys.